Miriam Cain at Camper & Nicholsons says that Simon Goldsworthy in the London office has listed the 25.3m sailing yacht Mr Gecko for sale again. She was withdrawn from the market in late 2008 when her asking price was €2.5 million and, recognising a sluggish market for sailing yachts, the owner has agreed to price her now at a realistic €1.6 million and is prepared to negotiate even on that price. 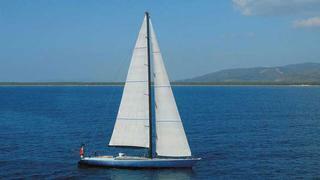 Mr Gecko is a fast cruising sloop built at Sangermani under licence from Wally Yachts in 1990. Bought by her current owner in 2004, more than $5 million has been spent on this superyacht over and above normal maintenance work. This has included new paint, rigging, teak decks and upgrading of her interior and machinery. Just repainted in early 2009, she also has a recent full survey available from QI Composites giving her a 100% clean bill of health.